See, us Lunchers fit in everywhere, whether it's among the registered members at the Ipswich Institute, the righteous movers at Dance Eats or the real men at Bourne Bridge. We're light bite Zeligs, on our best behaviour at the Wicked Cafe, blending in at Blends or simply enjoying Enjoy. A first, though, this week: we're upgrading to a Grade I listed building, natch. Sitting plum square at the shallow end of Christchurch Park is The Mansion. For years it's been a free-to-enter museum with more Constables than PC World. 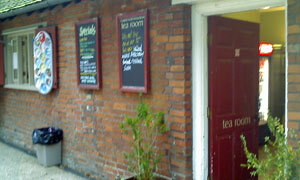 More recently it's sprouted a tea room with a few tables inside and lots more seating in the rear courtyard. All very pleasant. Follow the signs done out in a Prisoner typeface near the Lost-type hatch. Andy's used his hi-vis jacket to claim the VIP area, namely the bench under the gazebo. I'm not that late and he's already well into his savoury. Don't mind me. Jackets and paninis aside, they offer daily full-meal specials too. I'll stick with the very reasonably priced bacon sandwich and boy, it's top-drawer. Thick slices, brown bread, soupcon of salad and presented with your choice of sauce sachet. Last to arrive is Rene, who claims to have found a parking spot on Fontainebleau Road. He too joins us in the festival of the rasher. Time's moving on and there's a need for sweetness. Inside to survey scones, choccy bars and a-ha, carrot cake. Nuff said. Rene throws me by ordering a slice with two forks: I ain't sharing. No, he's sharing with Andy, bless him. Good cake. Alas, mine all disappears before coffee arrives. I gather they're a bit short-staffed today and now there's a mini rush. Wind's getting up too and bad weather's a-comin', to be sure. Back on the saddle and quickly home to beat the oncoming storm. If it was a car -- Honda Stream. If they were passing by -- David Starkey.